Why do we love our Casa in Moraira? It is the peace and the wide view of the mountains. It is the picturesque village with its beaches and rocky shores, just 2 km away. It is the evergreen vegetation, always it blooms in our garden. 320 days of sunshine a year. You can have breakfast in the morning sun on the front porch at noon lying on manicured -gärtnerisch eingehegten- communal pool next to the forest or at the house on the large terrace in the sun and in the evening from the track protected conservatory from the sunset over the mountains. The house is ideal for couples or families with 4 people. It has 2 bedrooms, a bathroom, a living room and kitchen together of about 80 m². It has air conditioning, gas central heating, good TV, wireless internet and of course a washing machine. Oh yes, in just 1 km away we have 4 supermarkets and at 500m distance to bakers. We enjoy the evenings at the BBQ on our large terrace surrounded by subtropical plants. It is quiet and we see the sun over the mountains perish. We love the little mundane Moraira, as well as the neighboring towns of Denia, Jabea, Benissa and Altea with its old districts from the time of the Romans and the Moors, its narrow streets, numerous restaurants and small tapas bars, we love the hinterland with its mountains and pristine canyons. Many who came gladly return again. The house is cleaned by a private individual. She is available during your vacation for questions or special requests. The garden looked a gardener. Het huis is comfortabel en alles is aanwezig. Maar vooral het heerlijke terras met het geweldige uitzicht maken alles compleet.De WiFi was eerst goed en daarna zeer matig.Daar is in Spanje als je geen glasvezel hebt blijkbaar niets aan te doen. Maar toch gewoon vijf sterren. Mit unserer Buchung des Hauses haben wir uns genau das richtige Domizil für unseren Urlaub ausgesucht. Die Vorabinformationen von Herrn Körnich waren sehr gut, während des Aufenthaltes waren wir im Email Kontakt, der immer sehr freundlich war. Die Bilder in der Beschreibung und die Beschreibung selbst sind absolut zutreffend. Im Haus liegt ein Hefter, mit allen Informationen die das Haus betreffen aber auch Informationen über Ausflugsziele und Restaurant- Empfehlungen. Das Feriendomizil war sauber und die Anlage in gepflegtem Zustand. Empfehlen kann ich noch den Wochenmarkt immer am Freitag ab ca.8 Uhr in Moraira auf dem großen Parkplatz hinter der Touristinformation und einen Ausflug nicht weit entfernt auf den Cumbre de Sol ( mit dem Auto hochfahren), mit einer tollen Aussicht über die Küste. Wir haben uns in der Unterkunft sehr wohl gefühlt und unsere Urlaubszeit dort sehr genossen. Gerne kann ich die Unterkunft an Freunde weiter empfehlen. Ach so: das Internett ist ein bischen langsam. 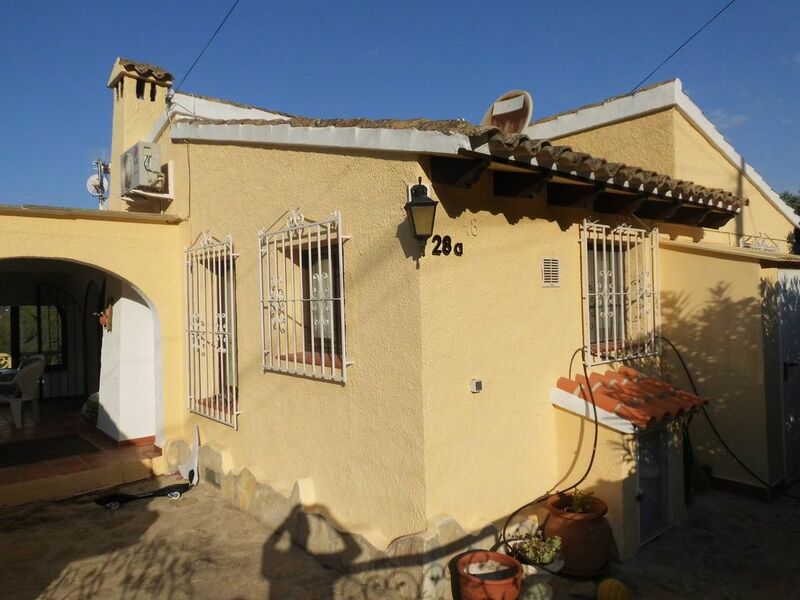 Llevamos años volviendo Moraira y la zona en la que se encuentra esta casa es una de las más tranquilas, acompañado por unos vecinos, mayoritariamente alemanes, agradables y poco bulliciosos. Bien comunicada, cerca del pueblo si nos gusta pasear, atravesando las diferentes urbanizaciones, no más de 30 min. También podemos hacerlo del mismo modo siguiendo la comarcal que dispone de acera y que es utilizada por muchos residente para evitar coger el coche. La casa está perfectamente acondicionada, con buen gusto, no faltándole ningún detalle ni utensilio. la piscina de uso común, es amplia y en nuestra estancia muy poco concurrida. todos los espacios comunes, así como los de la casa están perfectamente mantenidos, jardinería limpieza, etc..
las dos terrazas contiguas de las que dispone la casa, una de ellas acristalada, disfrutan de unas magnificas vistas, hacen muy agradables los desayunos o cualquier velada..un placer. Comentar que todo la gestión se realizo a través de homeaway, que justo días antes de la llegada tuvimos problemas por no poder localizar a la persona de contacto en el lugar. Somos usuarios de este portal mucho tiempo sin haber tenido ningún problema. En este caso no me gusto la falta de seriedad, y la poca ayuda que prestaron, las garantías que aseguran dar, no lo son. Finalmente se resolvió el mal entendido, gracias al propietario, y pudimos disfrutar de las vacaciones. Desde luego recomiendo esta propiedad por servicios, ubicación y seriedad del propietario. La tendré en cuenta para el año proximo. Preise sind inclusive Strom und Wasser. Rauchen ist im Hause nicht gestattet.